Waste management is essential to the community, but not all people have access to good waste management. The World Bank estimates that 19% of the people in the United States live in remote rural areas. That 19 percent, unfortunately, do not have the same waste management coverage as those who live in urban environments, which causes problems for the community. Everado Diaz, who lives in the rural area of Brownsville, Texas, is frustrated with illegal dumping across the ditch near his house. Diaz is tired of the ”mile stretch” of trash that covers the drainage ditch with couches and mattresses. Apparently the illegal dumping has accumulated over the years, and Diaz nor the local officials “know who they are”. Illegal dumping in Cameron County is a problem not just near Diaz but throughout the whole county. Pete Delgadillo, a Cameron County Constable, says it is hard to deal with illegal waste dumping in secluded areas because they have the “lack of manpower” to protect rural areas. Cameron County is currently working with the sheriff’s department to find ways on how to stop illegal dumping. Counties with remote rural areas throughout the country are dealing with illegal dumping. Waste management in the local government seems to not have enough “manpower”. Finding tools that cost less “manpower” and are remote will prove to be an effective way to stop illegal dumping. 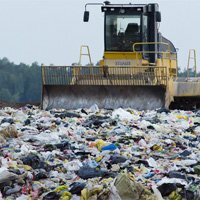 What tools does your city use for waste management problems?